Little is known about the evolutionary history and origin of Hepatitis B Virus. Recent research confirms the idea that Hepatitis B Virus has existed in humans for centuries. Scientists extracted genomic data extracted from the mummified remains of a child buried in the Basilica of Saint Domenico Maggiore in Naples (Italy). 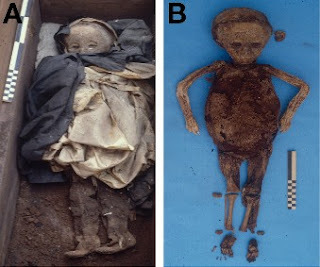 Previous scientific analysis of the 16th century (radiocarbon dating is AD1569±60) remains suggested the child was infected with Variola virus, or smallpox. In fact, this was the oldest evidence for the presence of smallpox in Medieval remains and a critical time stamp for its origins. Using advanced sequencing techniques, researchers now suggest otherwise: the child was actually infected with Hepatitis B Virus. Interestingly, children infected with Hepatitis B Virus infections can develop a facial rash, known as Gianotti-Crosti syndrome. 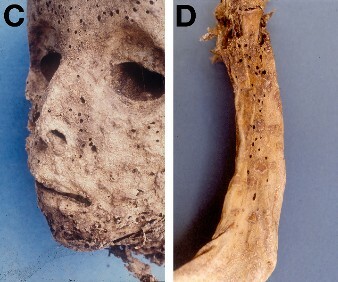 This may have been misidentified as smallpox and illustrates the difficulties of identifying infectious disease in the past. “The data emphasizes the importance of molecular approaches to help identify the presence of key pathogens in the past, enabling us to better constrain the time they may have infected humans,” explains Hendrik Poinar, an evolutionary geneticist. “The more we understand about the behaviour of past pandemics and outbreaks, the greater our understanding of how modern pathogens might work and spread, and this information will ultimately help in their control,” says Poinar. Using small tissue samples of skin and bone, scientists were able to tease out tiny fragments of DNA and then stitch together pieces of genetic information to create a much more complete picture. While viruses often evolve very rapidly - sometimes in just days - researchers suggest that this ancient strain of Hepatitis B Virus has changed little over the last 450 years and that the evolution of this virus is complex. The team found a close relationship between the ancient and modern strains of Hepatitis B Virus, but both are missing what is known as temporal structure. In other words, there is no measurable rate of evolution throughout the 450-year period which separates the mummy sample from modern samples.